Digging for nuggets from the dusty old storerooms of pop. 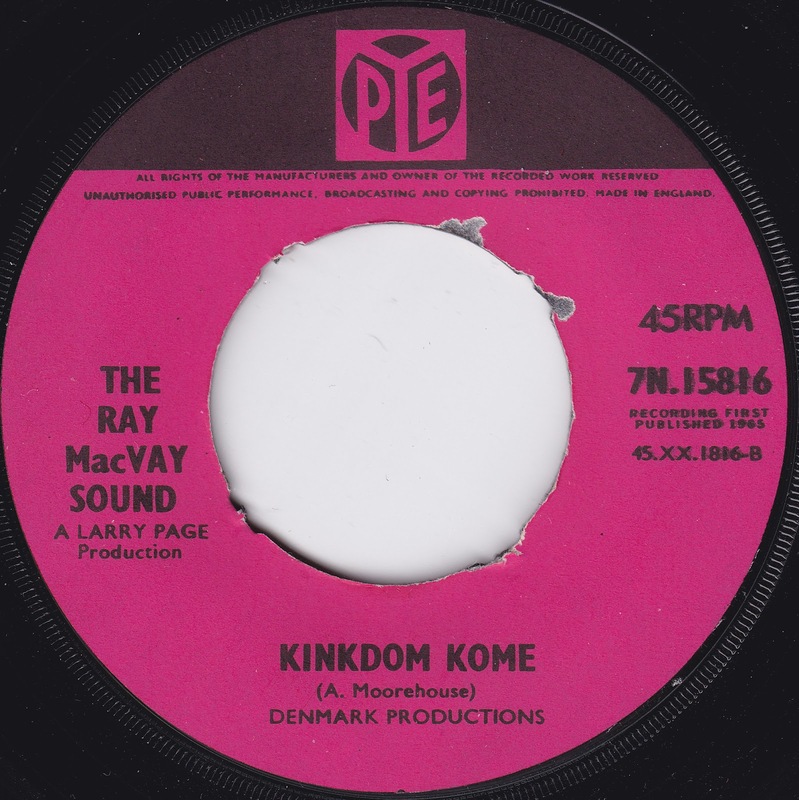 This is a baffling but very sought-after single from the prolific easy listening master Ray MacVay, who we last mentioned just over a year ago. Ray was perhaps more daring than many pseudo-James Last characters in the work he took on, attempting reggae, rock and country as well as the pop tunes that loaned themselves best to a nice and easy arrangement. This, however, appears to be a Kinks kash-in. While the repetitive central riff on side A does owe a small debt to Ray and Dave Davies, the band don't get a songwriting credit, and it seems that MacVay and Larry Page - who does get credited - were just using their sound as a springboard. The end result sounds like a cross between a late night chat show theme and The Kinks, which is no bad thing. Indeed, I'm slightly surprised nobody has dug this one up to use on a television programme at any point in the last fifty years. It's also found some favour as a turntable hit with the mod club crowd, which has pushed up the asking price of copies over the years. So far as I'm aware, Ray Davies' opinions on the single are unrecorded, though as it didn't even come close to being a hit, perhaps that's not surprising. Larry Page, however, was fascinated by the idea of The Kinks tracks being given the easy listening treatment, and you can hear the Larry Page Orchestra taking on his work here. Further examples are available on his "Music For Night People" LP and CD. John Robertson - thanks, that actually figures. VanceMan - I don't think I've heard that one before, but I agree - surely the title at least came from this?! Follow us on Twitter or Facebook and ensure you never miss a post. Can't download the mp3s or zip files? Baffled by the point of this blog? Please go to the FAQ first of all. Your answer should be there. NOTE - you can also join our Facebook group by clicking on this link or alternatively feel free to be a Twitter follower. My personal site where you can find out more about my writing can also be found here. "Left and to the Back" is a blog exploring the dark and dusty world of flop singles and albums, the kind you may find lingering near the stock room of your local second hand record store (if you still have one), or perhaps going for extortionate sums on ebay. For a better idea about the kind of music featured, both sublime and ridiculous, please go to our Spotify playlist here. Please note that L&TTB is not primarily a sixties blog, even though a lot of good "lost" material was released around this era and will be featured. In short, if I like it and it's interesting, I'll upload it. And sometimes if I don't like it but it's interesting, it will also feature. The music uploaded to this site is for evaluation only, and where it is otherwise available at a reasonable price I would persuade you to support your local second hand record store by buying it. Many of the posts on here are about digging around in these shops and being thrilled by ridiculous and obscure finds, and I hope I'm persuading a few more readers to get out there and dig around. So please do dig. Man. No blog or download site can ever be an effective substitute. Darren's music blog | Live reviews. From classic rock to contemporary folk. Indie Top 20 - The Blog! Real Gone | What's he building in there?